Cruise Ship Crew Gambia is a job placement and recruitment service for cruise lines and other hospitality industries. They have connected thousands of people with jobs in the cruise and hospitality industry. 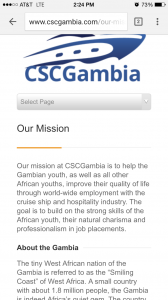 The company is based in Gambia, a country in West Africa. Their mission is to help young Gambian men and women (as well as young people in other African countries) improve their quality of life by finding employment within the cruise and hospitality industries. Cruise Ship Crew Gambia has partnered with the Gambia Tourism and Hospitality Institute (GTHI) to produce the absolute best candidates for placement. Cruise Ship Gambia approached 3PRIME looking for a sleek website that would serve as a great first impression to hospitality agents eager to bolster their staff with specially trained crew members. To accomplish this goal, 3PRIME selected a WordPress theme that meshed well with the client’s vision. This theme includes a homepage slideshow that features several high quality images. The theme is also responsive, meaning it works on screens of all sizes (including tablets and smartphones). Being responsive not only makes the website more user friendly and accessible, but it also helps the site’s search engine rankings. 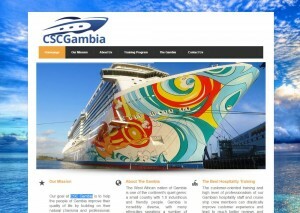 Cruise Ship Crew Gambia was co-founded by David White, owner of Universal Hotel Liquidators (a longtime 3PRIME client).